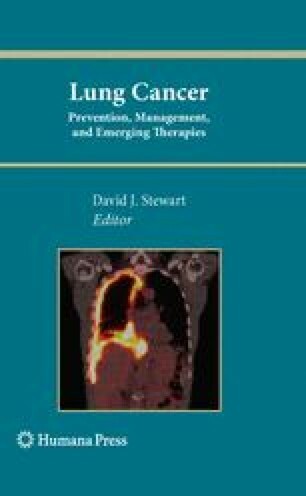 Inhibition of the epidermal growth factor receptor (EGFR) has become a standard target in the treatment of non-small cell lung cancer (NSCLC). This chapter summarizes the clinical trials that have been performed with small molecule tyrosine kinase inhibitors (TKI) and monoclonal antibodies targeting EGFR in NSCLC. Erlotinib has established second- and third-line efficacy following the phase III BR.21 study, results not seen in the corresponding ISEL trial with gefitinib. However, in the INTEREST trial gefitinib demonstrated non-inferiority to docetaxel in the second-line setting, and as first-line therapy may be better than chemotherapy in selected patients. Cetuximab also modestly prolongs survival when combined with chemotherapy as first-line treatment in patients with EGFR expressing tumors. Numerous other TKIs and monoclonal antibodies have demonstrated clinical activity in early phase trials. Novel TKIs may have the ability to overcome resistance to first generation TKI therapy. Furthermore, there are encouraging studies combining EGFR inhibitors and anti-angiogenesis drugs such as bevacizumab. In conclusion, EGFR inhibition, by a range of strategies, remains a central node in the treatment of NSCLC.